I’d like to propose making a little dish of buttons up at the front that members (and even non-members) can wear when the place gets busy. Green - You’re open to giving tours, meeting new people, and want to show off what you’re working on. Green can also be helpful for shy people who wish to start conversations and make new friends, but struggle to initiate. It tells people that you want to be approached. 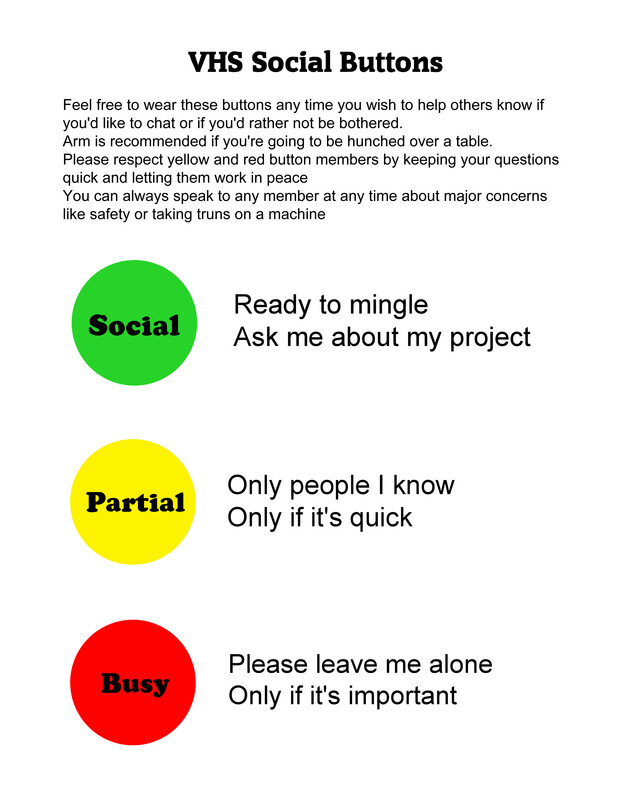 Yellow - You’re busy, but still willing to socialize with close friends or people you already know. No tours or strangers. Please keep your questions quick if you have them. Red - You are busy or tired or just don’t want to talk to anyone. Only interact if you absolutely must, but try to direct your questions and banter elsewhere. Any thoughts or ideas to add? we do have a button maker, let’s get on that. Possibly a spot to dry-erase in a name? It wouldn’t be VHS if we didn’t over-complicate something simple like this. But a coin cell, some LEDs and a little micro is totally feasible and could create all kinds of space. I really like the idea! Button party? I’d add a proximity sensor to that. Green if everyone is more than 3 meters away, changing to yellow as they get with in 2 meters and then red for that last meter. Woo hoo! Last night was a success! Now if y’all want blinky robot buttons, do it yourself!